The Gospel of today tells of the testimony of John the Baptist who is questioned by the priests and Levites as to who he is. He declares that he is not the Messiah nor is he Elijah the prophet, but that he is a voice in the desert, calling out to make straight the path of the Lord. St. Augustine says the Baptist was a voice/word for a while, but that Christ is the Eternal Word in the beginning. Earlier in St. John´s gospel we read that John the Baptist was sent by God to testify to the light, the real Light which gives light to everyone who comes into the world. The other biblical texts of today are from other sources, the book of Isaiah , the letter of St. Paul to the Thessalonians and St. Luke´s gospel. They tell of an immense gladness and joy. 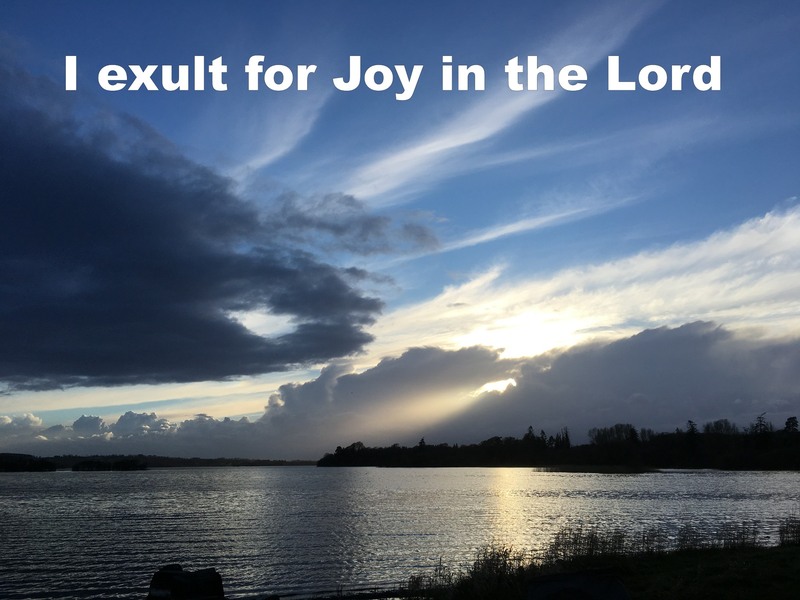 “I exult for JOY in the Lord”. As the Feast of Christmas draws nearer the theme of joy is introduced, symbolised in the colour of the vestments which are rose-coloured instead of purple. In the Apostolic Exhortation of Pope Francis it is called the Joy of the Gospel, and the story of the Gospel begins with the pleasure of the Father in the Son: “Thou art my beloved Son; with Thee I am well pleased.” At the heart of the life of God is this mutual delight of the Father in the Son and the Son in the Father, and this delight is the Holy Spirit. Meister Eckhart wrote: The Father laughs at the Son and the Son laughs at the Father and the laughter brings forth pleasure and the pleasure brings forth joy. This joy is not an emotion of God, a sunny, divine feeling. It is God´s being. It is the “I am” of the burning bush that Moses encountered in the wilderness. Thomas Aquinas maintained that happiness was one of God´s names. Because this delight is God´s very being, then we cannot define it or understand it for, Thomas said, we cannot understand what it is for God to be God. So to be touched by God´s joy is to be inhabited by something that is beyond definition. This joy could not be described by Jesus, only embodied. That joy became flesh and blood in the face of Jesus. Likewise we cannot speak adequately of the joy who is God, but it may become embodied in our lives, incarnate in our faces. The Gospel is the story of how we travel towards our home in that joy. Everyone receives beyond what he or she thought possible. Elizabeth, the sterile, gives birth. Zachary, the incredulous, prophecies. The Virgin becomes a mother. The shepherds talk with the Angels. The wise men give all they have. Simeon no longer fears death. The first sign of Jesus in John´s Gospel is when He gave joy to all at the wedding feast at Cana by changing the water into wine. The context of a wedding was used in Old Testament times to symbolize the messianic days and one of the consistent figures for the joy of the final days is the abundance of wine. Each of the other six “signs” of Jesus in John´s gospel brings joy to those who are healed, brought to life, given food. Many of Jesus´ parables speak of joy: the rejoicing of the woman who found her lost coin and of the father who son was found. Then there is the great joy of those who recognise Jesus after His resurrection. When Jesus, filled with the power of the Spirit, returned to Nazareth, and began to teach in the synagogue on the Sabbath. He stood up to read and the scroll of Isaiah was given to him. He unrolled the scroll and found the place where it was written: the Spirit of the Lord is upon me, because he has anointed me to bring good news to the poor, sight to the blind, freedom to the oppressed. And it continues, I exult for joy in the Lord. In the second reading, St. Paul calls us to be joyful at all times and we remember that this joy is one of the fruits of the Holy Spirit. The Responsorial psalm is Mary´s Magnificat: ´my spirit rejoices in God my Saviour´. We celebrate our joy in bodily signs, by dancing, singing, laughing. We shout for joy, we hug each other. How we express it depends on what country we live in and the local custom. Jesus, in His discourse at the Last Supper speaks of His joy and our joy. “As the Father has loved me, so have I loved you. Remain in my love. You will remain in my love if you keep my commandments. This is my commandment: love one another as I have loved you. 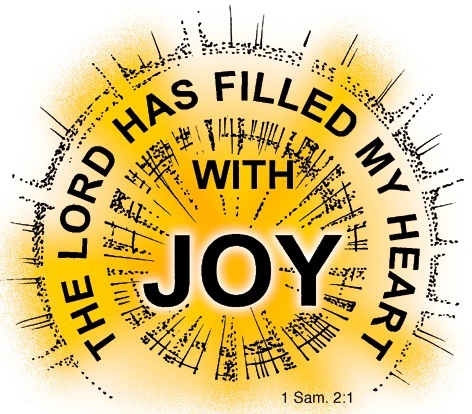 I have said this to you that my joy may be yours and your joy may be fulfilled”. This joy is not always “felt” by us: it is an inner joy, the joy of a living Faith, the Holy Spirit within us, who strengthens us each moment of our lives. As we run the race of this present life, may our Loving Father make us firm in faith, joyful in hope and active in charity.